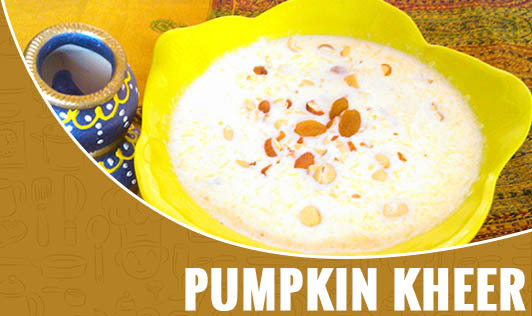 Pumpkin kheer is a unique, healthy, easy to make recipe. Made with fiber rich pumpkin and milk, this recipe will definitely help you sneak in the goodness of nutrition in your kid's diet. • Drain the excess water in a bowl; add half the cashewnuts, badam, elaichi powder to it and blendrize it together to make a smooth paste. • In a deep bottomed vessel, add the pumpkin, milk, nuts paste and sugar, and cook for 10 minutes while stirring continuously. • Lastly, heat ghee in a kadai and roast the remaining cashews and raisins for few minutes. • Pour the roasted nuts over the pumpkin kheer. • Use low fat milk. • Avoid adding nut paste and reduce the quantity of ghee.